While there was once a time where only 2-door coupes were taken seriously as sports models, the Audi RS Q3 that debus this week at the Geneva Motor Show illustrates how well Audi can turn anything into a high performance model by adding big power and a sharpened exterior to their small crossover – resulting in a great looking addition to the RS lineup. The Audi brand as a whole has an aggressive exterior design that caters to high performance models and the new RS Q3 shows that even in those segments that are the least likely to feature a high performance vehicle – Audi can make it happen. While the sports car sprawl has traveled from 2-door coupes to 4-door sedans to pickup trucks to SUVs, the small crossover segment is one that has avoided that bite of the go-fast bug. Those sport utility vehicles that offer a true sporty experience are generally bigger vehicles like the Jeep Grand Cherokee SRT8 or the Porsche Cayenne and while Audi has offered sport packages for the midsized Q5 with great success – this is a first for the compact Audi Q3. "The RS Q3 transfers the performance philosophy of Audi to the compact SUV segment, thereby creating a new performance class," says Franciscus van Meel, Managing Director of quattro GmbH. "In addition to the RS 5 Cabriolet, RS 6 Avant and RS 7 Sportback, the RS Q3 is the fourth RS model that we are launching on the market in 2013. The RS family is growing to eight members – more than ever." The Audi RS Q3 begins under the hood where this sporty compact CUV packs a turbocharged 2.5L 4-cylinder engine that has also been used for high performance models like the TT RS and the RS3. The RS Q3 offers 305 horsepower (228kW) and 310lb-ft of torque (420Nm) with that torque being available starting at just 1,500rpm. This powerful inline 5 is mated to the Audi 7-speed S-tronic dual clutch automatic that funnels power to all four wheels via the Quattro advanced full time all wheel drive system. Even though the RS Q3 weighs over 3,800 pounds, this aggressive little CUV can rip from 0 to 62 miles per hour in just 5.5 seconds on its way to a top speed of 155.34 miles per hour – and that limited top speed is only due to the fact that the vehicle is electronically governed. Once the drivetrain was well cared for, the design team turned to the handling capabilities of the Audi RS Q5. They began by adding a sport tuned suspension system that drops the RS Q3 right around an inch compared to the non-RS crossover with a rear four link independent suspension setup. Next, the team turned to the braking setup where a set of slotted and drilled front rotors measuring 14.3 inches has been installed to provide incredible stopping force with the help of some huge 8 piston brake calipers. Finally, standard 19 inch wheels or a trio of different 20 inch wheel options are available for the RS Q3, helping to improve handling, acceleration and braking while also looking great. To allow the new Audi RS Q3 to stand out in a crowd, the RS package adds an aggressive front fascia with gloss black honeycomb filler and the Quattro stamped prominently across the lower fascia opening, a large roof spoiler, a rear fascia with an integrated lower diffuser, a large exhaust tip, matte aluminum accents all around and unique RS Q3 badging. The RS Q3 looks awesome with the contrasting black and silver through the front and rear fascia while the large wheels and aggressive stance work with the physical look of the body dressing to look like a crossover that is deserving of the RS designation. On the inside, the Audi RS Q3 package adds unique grey gauges with white/red trim and RS badging, a three spoke flat bottomed sport steering wheel with paddle shifters and infotainment system controls, unique aluminum pedals, black leather sport seats with the RS logo and contrasting stitch work throughout –along with the high end entertainment system that is displayed on the screen that rises out of the dash. The new Audi RS Q3 is expected to arrive in the fall of 2013 with a price that will begin at €54,600 – or around $71,000 in US dollars. 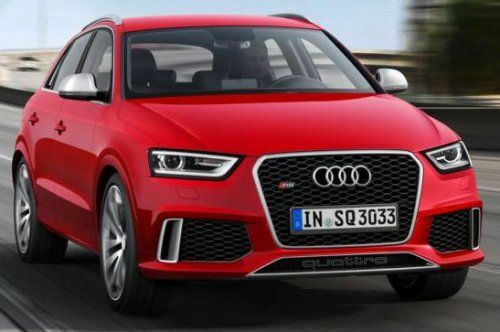 Sadly, the company currently does not have plans to offer the RS Q3 in the United States but with enough interest in their other RS models combined with increased Q3 sales – there RS Q3 could arrive in North American dealerships in the future. Even if it is never sold in the US, Audi deserves recognition for being able to turn pretty much anything into a high performance model and do so in a very successful way. Audi has issued a pair of videos detailing the new RS Q3 and you can check those out below.